My kids have turned into huge Cap’n Crunch fans this year and we tend to have a box of one of the different types of the Cap’n at all times. Well the newest flavor is the Chocolatey Crunch version of the cereal which will be a huge hit for all of those chocolate fans. 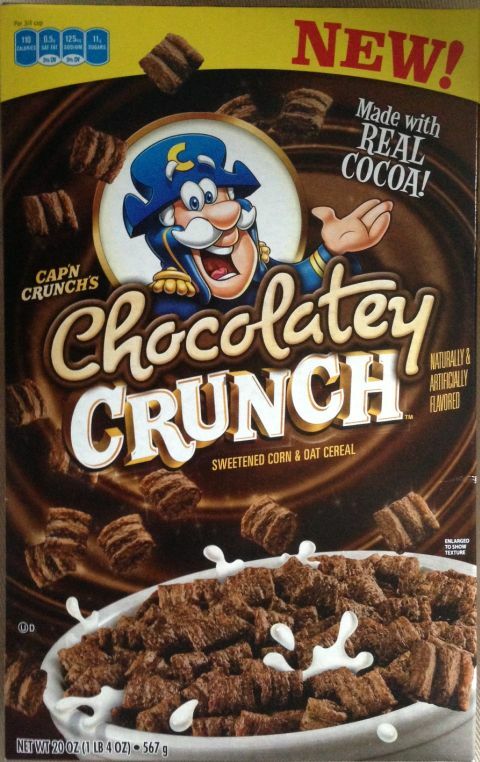 It looks to be the same consistency and shape of regular Cap’n Crunch just with the added benefit of chocolate, which for the fans of the original is a good thing. I have just found that the Cap’n takes a huge toll on the inside of my mouth with what I would call the “sharpest” cereal known to man. I did end up buying a box of the cereal at the store, so you can hopefully expect a report on Cap’n Crunch Chocolately Crunch sometime soon. Just don’t expect anything special from me, as I am not a huge fan of the texture of the cereal that the kids seem to like. I am also going to assume that it will create some delicious tasting milk in your cereal bowl after sitting around like good chocolate cereals do.